The PKN’s Online Shop Rules specify the terms and technical conditions of purchase of goods at the sklep.pkn.pl. The owner of the online shop is the Polish Committee for Standardization, ul. Świętokrzyska 14, 00-050 Warszawa (Warsaw), tax identification number (NIP): 525-10-08-869, statistical number (REGON): 010415408. 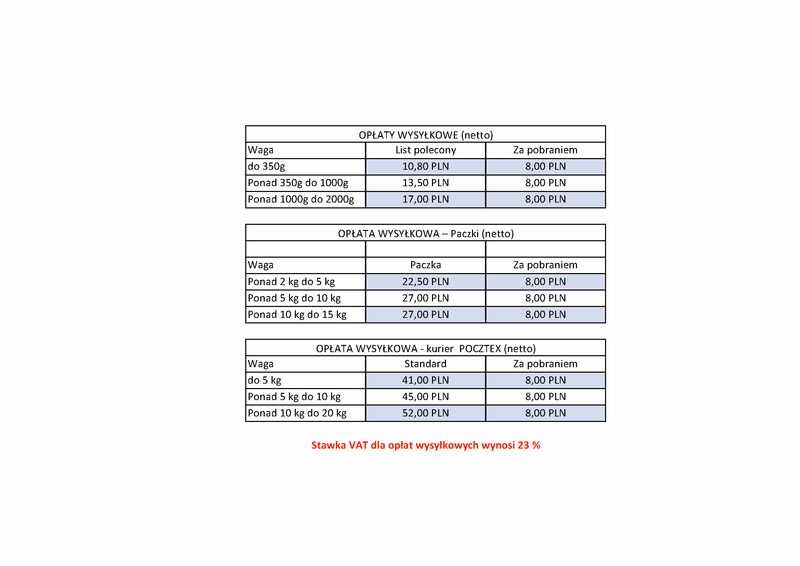 Sales are based on orders submitted at the sklep.pkn.pl. Prior to submitting an order, the customer shall have read and accepted these Rules. Delivery – a delivery of Goods, specified in a submitted order, by the Seller, to a Customer, completed with use of own IT systems or through an external provider on the terms and conditions set forth in these Rules. Business Day – shall be understood to mean any day other than Saturday or a public holiday within the meaning of the Public Holidays Act of 18 January 1951. Customer – a person who visits the sklep.pkn.pl in order to shop at the Online Store. Login - e-mail address assigned to a given Account, allowing for later identification when using the Online Store. Password - a sequence of characters consisting of letters, numbers, special characters provided by the Customer during the registration process. Entrepreneur - a Customer who is not a Consumer, being a natural person, a legal person or an organizational unit whose applicable regulations grant legal capacity, conducting business or professional activity on its own behalf, concluding a Sale Agreement with the Seller. Sales Agreement - a contract for the sale of Goods within the meaning of the Civil Code, concluded between the Seller and the Customer by means of remote communication. Civil Code – the Civil Code Act of 23 April 1964. Consumer – a person referred to in Article 221 of the Civil Code. Polish Standard/PN – the Polish Standard within the meaning of Article 5 of the Standardization Act. Rules – these Online Shop Rules. Online Shop – the online shop operated by the Seller at the sklep.pkn.pl. Standardization Act – the Standardization Act of 12 September 2002. Consumer Rights Act – the Consumer Rights Act of 30 May 2014. Sales Department/WSP – the unit of the Polish Committee for Standardization responsible for operation of the Online Shop. The services referred to in paragraph 1 above, are provided free of charge. To use the Online Shop you need a computer or a mobile device with a web browser. To place an Order, it is necessary for the Customer to have an e-mail address. Account registration allows: placing Orders without having to provide Customer data each time, modify Customer data, view the status of the Order, view the history of orders, download the ordered goods in the form of a file to be downloaded and / or a file to read. c) the possibility of expressing additional consents for the processing of the Client's personal data, including for marketing purposes. Statements regarding paragraphs 6 point b); c) are made by ticking the box next to the content of the relevant statement during the registration process. d) password that will be used to log in to the Account in the Online Shop. The Seller reserves the right to refuse to register an Account in the event that the e-mail address provided during the creation of the Account has been assigned to another Account. d) using the Online Shop and its functionality in a manner inconsistent with the provisions of the Regulations. The Seller reserves the right to block the Customer Account that uses the Online Shop in a manner contrary to its intended use and the provisions of the Regulations. The Customer is obliged to keep the Login and password for the Account confidential and not to disclose it to third parties, with the exception of persons authorized by him, performing actions related to the use of the Account on behalf of the Customer, including placing orders. The Seller maintains a Customer Account for an indefinite period of time. The Customer may at any time withdraw from the Account by sending a request to delete the Account to the Seller's address. The Seller shall immediately and without charging any fees in this respect, not later than within 14 days from the date of receipt of the request, delete the Customer Account. The Seller reserves the right to verify the identity of the person requesting to delete the Account. The deletion of the Account does not affect the contract concluded by the Customer prior to the submission of the statement regarding the deletion of the Sales Agreement Account or the right to withdraw from them. The Seller shall not be liable for damages caused by incorrect or inconsistent with the provisions of the Regulations using the Online Shop. The Seller makes every effort to ensure that the functionality and functioning of the Online Store is as good as possible. In relation to the above, the Seller reserves the right to restrict access to the Online Shop in order to remove the failure or improve its functionality. The Seller does not apply a code of good practice within the meaning of art. 2 point 5 of the Act of 23 August 2007 on counteracting unfair market practices and the manner of their implementation. In order to place an order, the Customer shall select Goods by adding them to the virtual basket and by submitting the ordering party’s data at sklep.pkn.pl. The Customer must complete the entire order form with true and accurate data. Following the order placement, the Customer shall receive an automatic answer in electronic form (to the e-mail address specified in the order form) with a confirmation of the order and details of the method of payment for the Goods ordered. Where no confirmation of the order is received by the Customer, it shall be understood that the order could not have been processed. Where the Goods ordered are not available, a relevant message shall be provided by the Seller to the Customer without unnecessary delay, in electronic form (to the e-mail address specified in the order form) or by telephone. The Seller shall reserve the right to refuse to process an order where the data concerning the method or date of payment differ from the ones specified in these Rules and have not been agreed on with the Seller beforehand. The Seller shall not accept orders placed by telephone. An order shall be deemed accepted for processing upon confirmation of the order placement by the Seller, on the terms and conditions set forth in these Rules. The prices of all Goods offered by the Seller shall be in PLN and shall be gross prices (i.e. VAT inclusive). The total cost of an order shall consist of the net prices of Goods, the VAT at the applicable rate, and a Delivery fee based on the weight and method of shipment. Prices of all Goods offered by the Seller via the Online Shop shall be binding as of the date of the Client’s order placement. The Seller’s discount policy is available at Discounts. The Seller may offer customers discounts for the purchase of Goods by providing the customers with discount codes. The terms and conditions of using rebate codes, in particular the rebate amount, the validity period of the rebate code, the Seller provides to the Customers together with the rebate code. A customer who wants to use a rebate code should enter the rebate code in the field provided when ordering. Following an order placement, the order may not be cancelled by the Customer later than on the next business day. Orders for which the payment method ‘Bank transfer to the PKN’s account – Pre-payment’ has been selected by the Customer shall be cancelled automatically in the event that the payment is not made in full within 14 days of the date of the pro forma invoice. Orders cancelled in accordance with these Rules shall be deemed not to have been placed. a report conforming a successful payment (e-transfer). The time of processing of orders for Goods where the order is placed via the sklep.pkn.pl website and where the ‘Bank transfer to the PKN’s account – Pre-payment’ payment method is selected, shall be 10 (ten) Business Days of the date when the full amount due for the Goods ordered is credited to the Seller’s bank account. The time of processing of an order for Goods in paper form or in electronic form – a file on a CD (pdf) – where a payment method other than referred to in Sections 1 and 2 above is selected, shall be up to 10 (ten) Business days of the date of the order placement. The time of Delivery shall be guaranteed by the supplier selected by the Customer and shall be governed by such suppliers’ rules. The Goods ordered shall be delivered, together with a VAT invoice, by postal service as certified priority mail or parcel, in accordance with the table of shipment fees, or by POCZTEX courier service. In the case of Customers other than Consumers, the Seller shall not be held liable for any delay in order processing for reasons beyond the Seller’s control, in particular for reasons attributable to the shipping entity, i.e. an external supplier. The cost of a Delivery shall be borne by the Customer, regardless of the value of the order. In the event that Goods ordered by the Customer are returned to the Seller due to a failure to collect the shipment on time, due to the Customer’s failure to provide the right address, or due to the addressee’s refusal to collect the shipment, the cost of the return shipment and, as appropriate, of a reshipment of the Goods shall be borne by the Customer. d. Cash (paid on Delivery). In the event that the payment is made with a payment card (without a physical presence thereof) or a bank transfer to the Seller’s account, the date of payment shall be the date when the amount is credited to the Seller’s account. The Customer selects the payment method when placing the Order. The above telephone numbers are operated on Business Days (Monday to Friday) from 8:00am to 3.30pm. A Customer who is a Consumer may withdraw from a concluded agreement without providing reasons for doing so, subject to Section 2 below, by submitting to the Seller an adequate written statement of withdrawal from the agreement, within 14 days of the date when the order was fulfilled, i.e. the date when the Consumer or a third party designated by the Consumer, where such third party is not a carrier, takes possession of the Goods. Appendix 1 hereto may be used as a template to submit the statement. The time limit shall be considered to have been complied with where the statement is sent before the expiry thereof. The right to withdraw from a concluded agreement shall not apply to a Consumer with regard to an agreement the subject matter whereof have been Goods in the form of a downloadable electronic file, an emailed electronic file, a readable file, in accordance with Article 38(13) of the Consumer Rights Act. In the event of withdrawal from an agreement, such agreement shall be considered not to have been concluded, and the Customer referred to in Section 1 shall be entitled to an reimbursement of all payments made, including the costs of supply of the item, except for the costs referred to in Section 6 and Section 8 below, without unnecessary delay, no later than 14 days of the date when the Consumer’s statement of withdrawal was received. The reimbursement referred to in Section 3 above shall be made with the same method of payment as originally used by the Consumer unless the Consumer expressly consents to a different method of reimbursement which entails no cost to the Consumer. The Seller may withhold the reimbursement of payments received from the Consumer until the Goods are returned or until the Consumer delivers a confirmation of a return shipment thereof, whichever occurs earlier. In the event that the method of supply of the Goods as selected by the Consumer is different from the cheapest customary method of supply offered by the Seller, the Seller shall not be required to reimburse any additional cost incurred by the Consumer. The Consumer shall return the item to the Seller or to a recipient authorized by the Seller without unnecessary delay, however no later than within 14 days of the date of the Consumer’s withdrawal from the agreement. The time limit shall be considered to have been complied with where the Goods are sent back before the expiry thereof. The Consumer shall only be liable for the direct cost of return of the Goods. In the event of withdrawal from the agreement the Consumer shall be liable for any decrease in the value of the Goods resulting from the Goods having been used beyond what is necessary to establish the nature, characteristics and functionality thereof. d. by properly completing the complaint form. Complaints filed after the deadline specified in Section 1 shall not be considered. After filing a complaint as referred to in Section 1 above, the Customer shall send the defective Goods to the Seller’s address, no later than within 2 Business Days of the filing date. Complaints shall be considered within 14 Business Days of the date when the Goods subject to the complaint are received by the Seller, and the Seller shall notify the Customer of the results, without unnecessary delay, in writing, to the address specified by the Customer in the complaint. In the event that a complaint is considered to be justified, the Seller shall replace the defective Goods with ones free of defects, or where such replacement is impossible, the Seller shall offer to the Customer different Goods of equal or higher value, or shall reimburse to the Customer an equivalent of the price paid. The Seller shall not accept complaints concerning the inconsistency of a withdrawn standard or other standardization documents in accordance with the PKN’s by-laws applicable to development of such documents (e.g. errors in the standards, inaccurate translation), given that a document subject to the complaint may not be corrected. The provisions of Sections 1 to 6 shall not apply to Customers who are Consumers, and the relevant provisions of the Civil Code shall apply instead. Pursuant to Article 5(5) of the Standardization Act, Polish Standards shall be copyright-protected like literary works, and the author’s economic rights shall belong to the Polish Committee for Standardization. With regard to a Polish Standard purchased, a license shall be granted by the Seller to the Customer for the use of such standard for the purpose of the Customer’s economic activity, statutory activity or other activities. The license shall be non-exclusive, unlimited in time. In the event that any electronic version of a Polish Standard is purchased, the license shall only authorize making of one paper copy for own use, which shall be non-transferable and may not be used otherwise (reproduced, transmitted, rented, leased, resold), for business purposes. The license shall not include a right to market or transfer Polish Standards, in full or in any part, to third parties, against payment or free of charge, in any legal form, or to amend the Polish Standards. The license may not be transferred to third parties and shall not authorize sublicensing. The administrator of personal data is the Seller. Providing the data is voluntary, but necessary to make the sale, their processing is based on the contract for the sale of standardization products or consent expressed in order to set up an account in the online shop. The customer has the right to access their data, rectify, update, limit processing, transfer and withdraw consent and delete data. The data will be processed for the period resulting from the implementation of the Sales Agreement. This period may be extended by a period of limitation of claims, if the processing of personal data will be necessary for the pursuit of any claims or protection against such claims by the controller of personal data. In disputable matters, the Customer has the right to lodge a complaint with the supervisory body. Clarifications regarding matters related to personal data are provided by the Inspector of Personal Data Protection tel. 225567661, e-mail: daneosobowe@pkn.pl. These Rules shall become effective on 25.05.2018 and its provisions shall apply to all orders placed after this date. The Civil Code, the Consumer Rights Act and other mandatory rules of the Polish law shall apply to issues not regulated in these Rules.